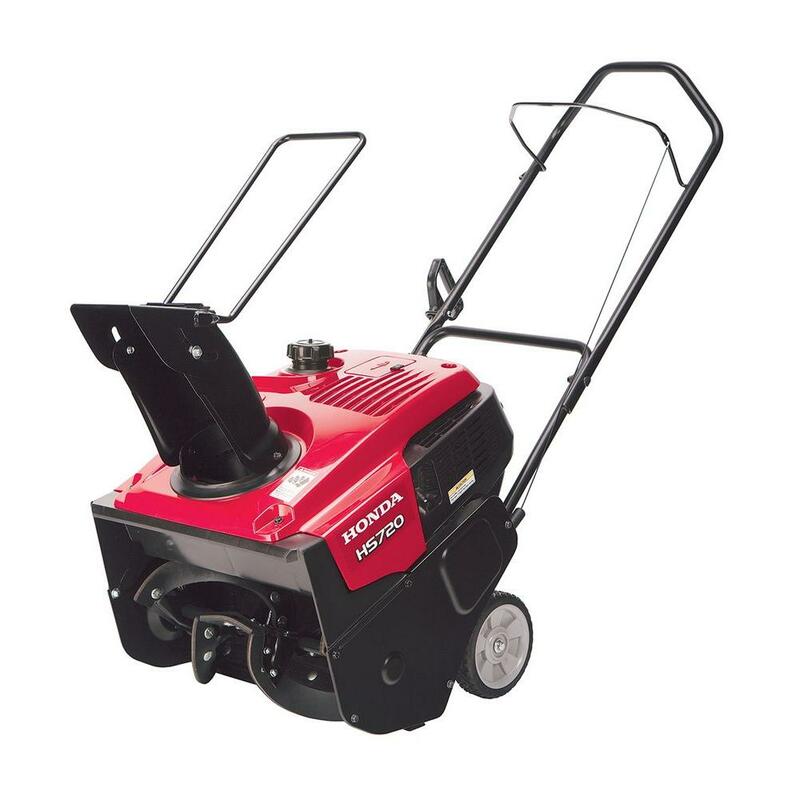 Want to make sure your light-duty Honda snow blower maintains its performance? Here’s what you need to know to keep your HSS724AT, ATD, AW or AWD two-stage snow blower working reliably. Before use: Check engine oil level, skid shoes, scraper, tire pressure, shear bolts, and bolts and nuts. Before storage: Lubricate joints and chains, drain fuel system and charge battery. First month or 20 hours of use: Change engine oil. Check tracks (if equipped,) belts and cables. Every 100 hours: Change oil and clean spark arrester. Every four years or 300 hours: Replace spark plug. 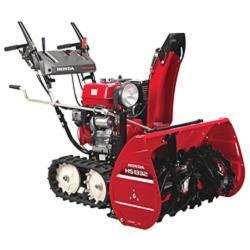 Honda recommends having these snow blowers professionally serviced before the start of the season for cable and belt adjustment, every 300 hours for engine maintenance, every two years for fuel system cleaning, and every 1,000 hours for combustion chamber cleaning. To drain the fuel system, remove the sediment cup on the bottom of the carburetor and turn on the fuel valve. Once drained, replace the cup and run the engine until it stalls. When checking the oil, do not screw the dipstick into the filler neck. The engine has an extension on the drain plug to allow oil to drain outside of the snowblower frame. When draining the crankcase, use a 17 mm wrench to keep the extension from spinning and a 10 mm to unscrew the drain bolt. Always use a new washer when reinstalling the drain bolt. Torque the drain bolt to 8.1 ft-lbs. to get a tight seal. This engine holds 0.6 quarts of 5w20 oil. When filled, the oil level should come up to the bottom edge of the filler neck opening. The spark plug is above the cylinder head, just to the right of the muffler. Wait 20-30 minutes after running the engine before checking the plug to prevent burns from the exhaust. The spark plug gap should be between 0.028 to 0.031 inches. When installing the plug, torque it to 13 ft-lbs. With 11 lb-ft. of pressure on the top center of the tread, the tread should deflect 7/16 to 5/8 inches. Tension is controlled by tensioner bolts on the rear axle. To change the tension, loosen the outer lock nut, then turn the inner tension nut. Once the tension is correct, torque the lock nut to 16 ft-lbs. On wheeled models, the tires should be aired up to 20 PSI. When checking the tire pressure, be sure to check the tire surface for signs of damage and dry rot, replacing as needed. Shear bolts are designed to snap if the auger or impeller is jammed, cutting power transfer. Always use genuine Honda shear bolts to ensure they break away before your machine is damaged. If a bolt breaks, shut off the engine and wait until everything on the snow blower has come to a complete stop before walking to the auger. The carriage shear bolt is for the impeller. It goes into a hole directly behind the transmission. The auger connects to the transmission using a pair of standard shear bolts. These go in holes next to the transmission. All shear bolts thread into 6 mm self-locking nuts. Shoe wear: If the edge of the shoe is less than 0.02 inches thick, flip the shoe upside down to use the other edge. If both edges are worn, replace the shoe. Shoe and scraper adjustment: If your model has track drive, push auger height adjustment lever and push on handlebars to raise to max position. Release pressure on the bars and let the auger slowly lower until the skid shoes contact ground. Scraper ground clearance should be 3/32 to 5/32 inch under all operating conditions. Torque scraper bolts to 18.5 lb-ft. and skid shoe nuts to 19.5 lb-ft.
Electric start models have a battery inside a housing next to the handles. Check the voltage every 6 months. If the output is under 12.9 volts, it needs to be recharged at 1.2 amps for 5-10 hours. Hondalawnparts.com is an authorized Honda Engines and Honda Power Equipment dealer. That means we’re able to ship OEM parts and accessories for your snow blower and its engine to any location in the U.S. or Canada. Our site has a section for commonly needed snowblower parts including belts and shear pins, or you can use our search engine to find parts specific to your model. Honda’s 720AA, 720AS, and 720AM snowblowers may be small, but they deliver enough power to clear driveways and sidewalks, making them a great choice for homeowners. If you just picked one up to use this winter, there are a few steps you need to take to get your new equipment up and running. These snowblowers are heavy, and the shipping carton is designed so that the blower must be lifted straight up for removal, so it’s a good idea to have someone on hand to help you get everything out of the box. – A gas can filled with fresh gas. While not required, it’s a good idea to use a stabilizer with the fuel since it may be weeks or months between snowfalls. A bottle of oil is included with the snowblower and can be found in a plastic bag with the owner’s manual. The model information can be found on a tag on the base of the snowblower at the back. 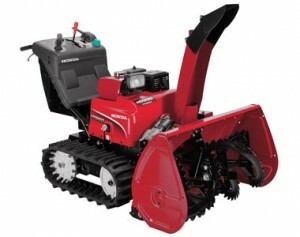 This information will be needed to register your snowblower with Honda and to order parts. There’s a place to write this down in your owner’s manual for easy reference. Remove the dipstick from the filler neck, located on the back side of the snowblower on the bottom left side. Using the funnel, pour the included oil into the engine. The crankcase is full once oil starts dripping out of the filler neck. Screw in the dipstick. Gently unfold the handle, taking care not to pinch the control cables. Use the 12 mm wrench to tighten down the nuts where the two halves of the handlebar meet. Remove any cardboard packaging. Remove the spark plug door, located on the top of the snowblower housing. Clip the spark plug cap onto the plug and snap the door back into place. The chute needs to be installed on the 720AM. Place the chute over the discharge opening near the front of the snowblower and line up the screw holes. Slide the screws into the holes through the inside of the chute and thread on the nuts from the outside. Tighten down the screws with the screwdriver and 10 mm wrench. Once installed, move the chute around to ensure it fits correctly and doesn’t bind. On 720AS and AA models, the operation of the remove chute controls should be checked before use. Move both the pitch and angle levers through their full length of motion to make sure the cables are operating correctly and the chute doesn’t bind. Remove the fuel tank cap on the top of the snowblower and add gas. The tank is full once the fuel level reaches the bottom of the filler neck. The controls for the engine are located on the rear of the snowblower body. Turn fuel valve to “ON,” turn the engine switch to “ON,” and pull the choke. Pull the recoil starter lightly until you feel resistance, then give it a hard pull. If everything was set up correctly, the engine should fire up. Push in the choke. Connect the starter box, located to the left of the chute angle control, to a grounded three-prong outlet using a three-prong outdoor-rated extension cord. Turn the fuel valve to “ON,” turn the engine switch to “ON,” and pull the choke. Press the start button on the starter box until the engine fires up. Once the engine is running, push in the choke and disconnect the extension cord. The drive belt and shear pins are designed to fail if something gets jammed in the auger to prevent damage to more expensive components. 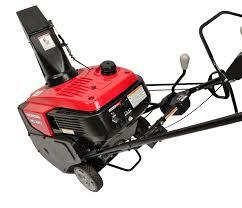 Have some spares on hand will let you quickly repair your snowblower after the obstruction has been removed. Where can you buy them? www.hondalawnparts.com. We’re a certified dealer for Honda Power Equipment, letting us provide everything you need from shear pins to major components. Finding parts is easy: just select your model and serial number range, and our site can show you factory parts diagrams and descriptions to help you identify exactly what you need. We ship across the U.S. and Canada. Summer is officially over, and winter is on it’s way across the United States, so it’s time to start thinking about your snowblower options. Snowblowers are capable of digging out a car, clearing a path out of the house, or preventing dangerous slips and falls after a storm. 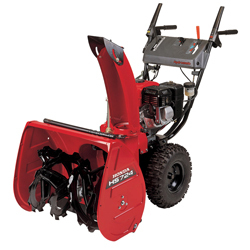 Snow blowers commonly encounter obstructions while in use, such as rocks or children’s toys. When an auger impacts a solid object, significant stresses are imparted to the auger, the motor, the gearbox, and the blower. 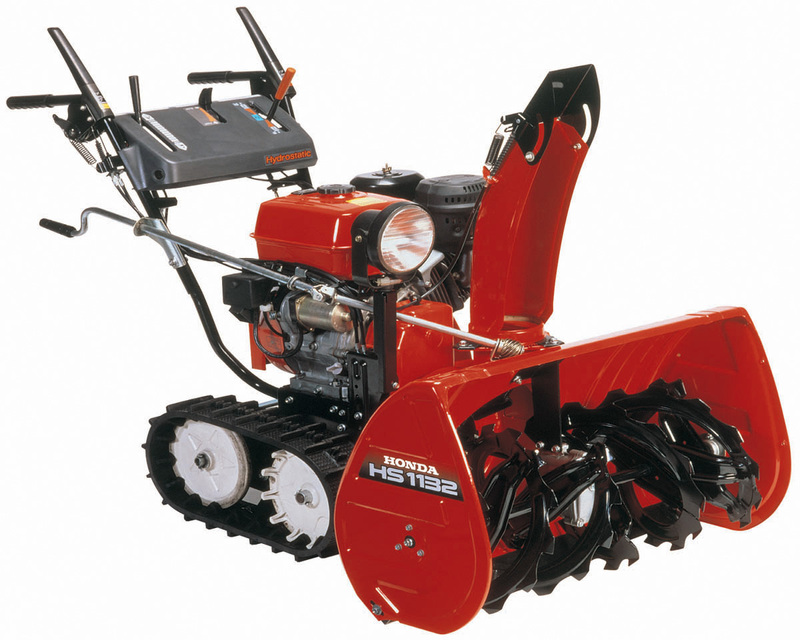 To prevent damage to these expensive components, snow blower manufacturers commonly use shear pins or shear bolts that are designed to fail above a certain stress threshold. This will permit the auger to spin freely, thus relieving the stresses on it and the driveline. 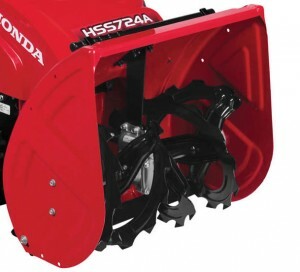 Honda uses shear bolts in their snow blowers.